Looking for something fun to do tomorrow in the long, summer night? Come screen two short documentaries on ghost bikes presented by the bicycle brigade Ovarian Psycos. What is a ghost bike? 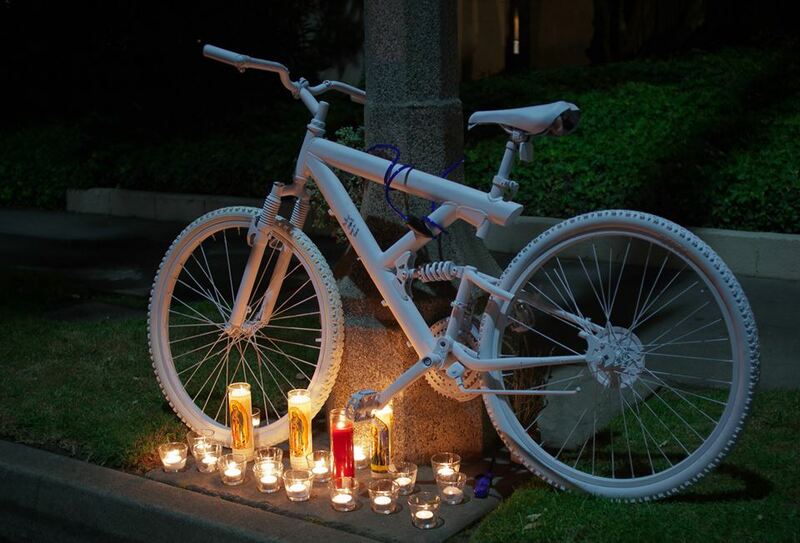 They are white-painted bicycles that are places as a memorial near the site of where a cycles was killed by a car. They serve as a somber reminder to motorists and others to keep an eye out for bikers. A year ago, I lost my friend, Phillip O’Neill, when he was struck by a car from behind as he was biking near Cal Tech. He was an incredible person, and it’s a shame the world lost him. A ghost bike was placed near the accident site in his memory. This is a topic that strikes a chord within me, so I’m looking forward to learning more about the ghost bike program. The event kicks off in Boyle Heights at 7:00, with the films starting at 7:30. $5 gets you admission, popcorn and water. Check it out! See the Bike-In Movie Night’s Facebook event page here. Ghost bike of Phillip O’Neill. Image borrowed from the BikinginLA blog.